As we’ve been discussing on our blog all week long, the need for unbeatable customer service is at an all-time high. With the holiday shopping season in full swing, most companies throughout North America are experiencing higher than normal call volumes. They’re not just accepting more calls – they’re getting calls from consumers who are in rushes, need things quickly and don’t have a ton of patience. Naturally, it’s important for the phone agents representing your business to have patience themselves. Accurately addressing the concerns of your callers means getting all of the pertinent information correct the first time and promptly addressing it. However, there may be those situations when a little extra time to resolve an issue is needed. As a result, you may have to place your callers on hold. No one likes being on hold. That’s not your fault. It’s just a fact of life. That’s why it’s so important to practice the appropriate holding techniques that will both resolve customer issues and make customers happy enough to continue supporting your business. Most people know that hold time is inevitable. It’s all about how you go about initiating hold time. Be sure to ask, not tell. “May I please place you on hold for a minute while I look into that for you?” is a much better option than “Hold please”. In asking this question, you’re not just showing respect, but you’re also providing an indication of how long the caller will need to wait. This helps for the person to not feel like he/she will be waiting too long. If you require more than the time frame you provided, be sure to come back to the line to request more time. The majority of customers will both understand and appreciate the gesture. As well, be sure to thank your callers for holding every time you come back to the line: “Thanks for holding, I’m sorry to keep you waiting.” That apology works wonders as well. Again, it’s a measure of respect that won’t go unnoticed. 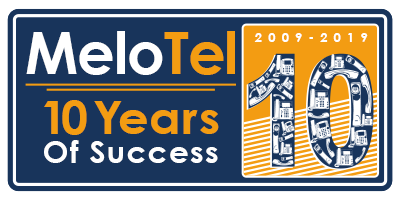 At MeloTel, we proudly offer VoIP-based Commercial Phone Services that come with Custom Hold Music. It’s a huge plus during the holiday season as holiday music both puts callers in festive moods and ensures them that they haven’t been disconnected from their calls. For more information, please don’t hesitate to contact us at 1-888-MELOTEL or use the Live Chat feature on our website!